Bringing world-class productions has always been at the heart of Ayala Malls Cinemas. Movie patrons seeking classical forms of art will be treated to a series of engaging stage plays as if they are really at the MET. 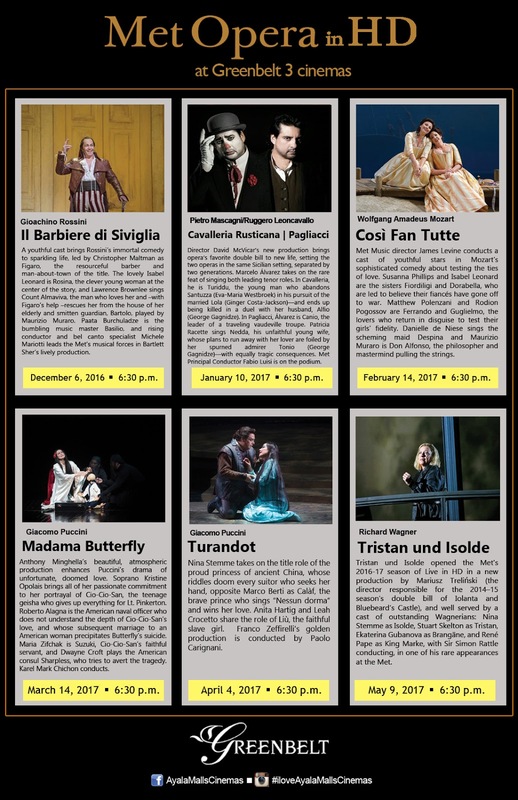 The special screenings continue on January 10 with “Cavalleria Rusticana/Pagliacci,” followed by “Così Fan Tutte” on February 14, “Madama Butterfly” on March 14, “Turandot” on April 4 and “Tristan and Isolde” on May 9. 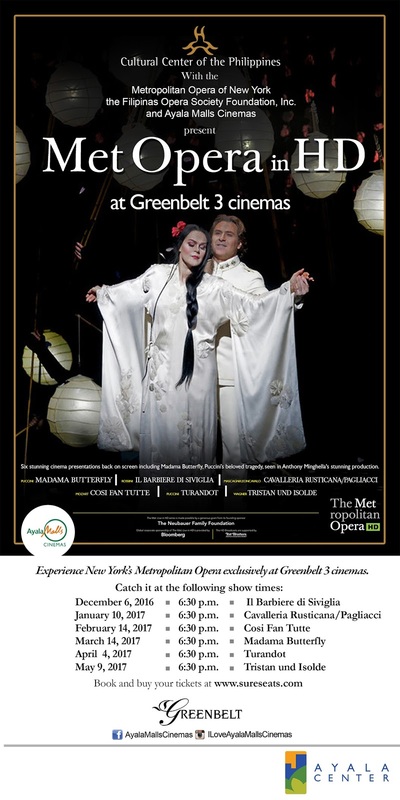 “Madama Butterfly” is the featured presentation during the opening night of Met Opera last November 8 at Greenbelt 3 cinemas. Through digital technology, the stage plays will be presented at Ayala Malls Cinemas’ Greenbelt 3 as it was recorded during their live performance at The Met – complete with backstage scenes, interviews with the actors and production crew. Ayala Malls Cinemas brings to the local scene productions composed by world-renowned and legendary artists Giacomo Puccini, Gioachino Rossini, Pietro Mascagni, Ruggero Leoncavallo, Richard Wagner and Wolgang Amadeus Mozart. Sparkling with wit and energy, “Il Barbiere di Siviglia” (The Barber of Seville) is about a resourceful barber and man-about-town. Count Almaviva arrives in Seville to search for the mysterious woman he met in Madrid. When he learns that she is Rosina, due to be married to her tyrannical guardian Bartolo, he enlists the help of the cunning barber Figaro to win her hand. Almaviva and Rosina fall in love, and Rosina turns her mind to duping Bartolo. The combined conniving of all three is too much for Bartolo, who has to admit defeat when he discovers Almaviva and Rosina have married right under his nose. “Cavalleria Rusticana / Pagliacci is about two complementary works that tell dark tales of passionate love that sours to violent jealousy. “Così Fan Tutte” is a romantic comedy that tells the tale of two men testing their fiancées’ faithfulness on the prodding of a cynical old man named Don Alfonso. The men, Ferrando and Guglielmo pretended to go to war leaving Fiordiligi and Dorabella while Don Alfonso continues his scheme of luring the sisters to fall for other men. “Madama Butterfly” is a beautiful atmospheric production is about an unfortunate, doomed love. Soprano Kristine Opolais brings all of her passionate commitment to her role of Cio-Cio-San, the teenage geisha who gives up everything for Lt. Pinkerton. In “Turandot,” Nina Stemme takes on the title role of the proud princess of ancient China, whose riddles doom every suitor who seeks her hand, opposite Marco Berti as Calàf, the brave prince who sings “Nessun dorma” and wins her love. Anita Hartig and Leah Crocetto share the role of Liù, the faithful slave girl. Franco Zeffirelli’s golden production is conducted by Paolo Carignani. The final presentation of Ayala Malls Cinemas’ Met Opera series, “Tristan and Isolde,” an audacious new production by Mariusz Treliński (the director responsible for the 2014–15 season’s double bill of Iolanta and Bluebeard’s Castle) sees an Irish Princess, Isolde, on board a ship from Ireland to Cornwall, as she marries King Marke who governs Cornwall. She is escorted by Tristan, the King’s loyalist and his nephew. Isolde has already fallen in love with Tristan. But now he delivers her to the King as though she were a prisoner. She compels him to take poison with her because she detests the idea of marrying King Marke. However, her maid, Brangane, prepares medicine of love instead of poison. When their ship calls at the port, they have already fallen passionately in love with each other. For advanced ticket purchase, log on to Ayala Malls Cinemas’ www.sureseats.com. 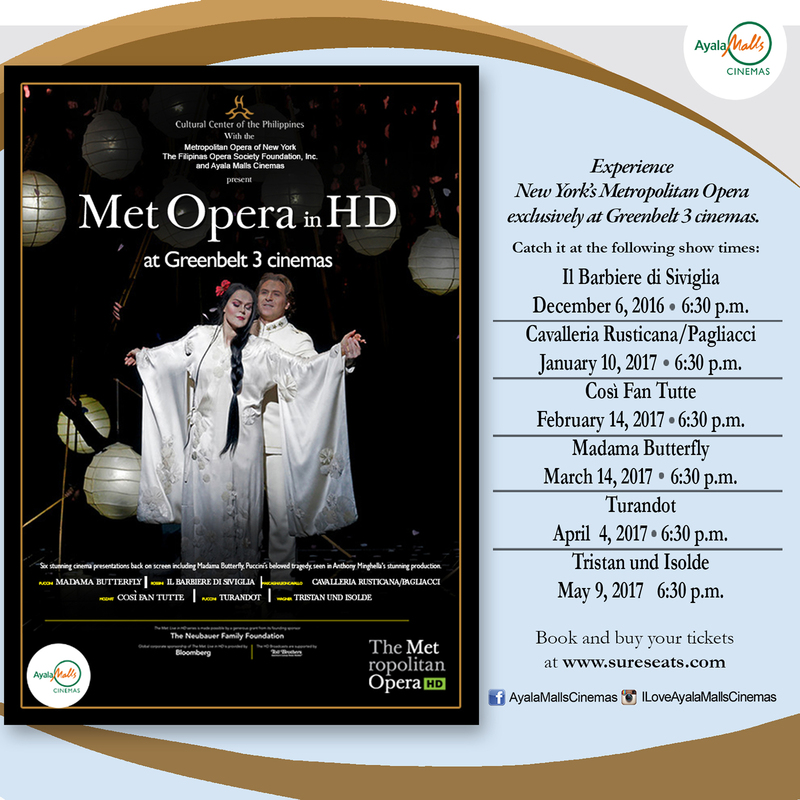 Tickets for the Met Opera series will be sold at Php 450. Ayala Malls Cinemas further invites patrons and cineastes to subscribe to all six shows for only P2,400.